Mark Altman and Edward Gross consider themselves experts on all things Star Trek. That being the case, the reader can't help but wonder why this book is filled with so many inaccuracies such as the fact that the authors can't seem to remember some of the episodes they review. Also, as die-hard original series fans, Altman and Gross compare all the spin-off shows unfavorably to the original. I wanted a less bias book. An unpretentious, alphabetical-order, straightforward two-man review book of all episodes up to the end of DS9 season four, and VOYAGER season two. Nothing earth-shattering, but always nice to read opinions I agree with...and disagree with reviews that drive me bats! 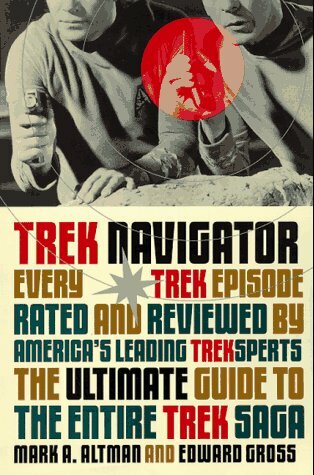 Would be nice to get some kind of updated version of this book, now that "Star Trek" on TV is pretty much complete...but I'm not going to hold my breath. As I read these reviews, it became apparent that these two reviewers were reviewing the episodes of the various Star Dreck series from memory and had not necessarily just watched each episode they reviewed. The tipoff was that for one episode--I forget what--one of the reviewers glibly wrote "I haven't seen this episode. If it's ever on, give me a call and I'll tell you what I think." 9/7/98. No library or iBooks.